I first stumbled across Reflect Who I Am while looking for unique Valentine's Day gift ideas for my upcoming gift guide, which will run from 2/1-2/10. And, like I do with all online stores I stumble upon, I like to check out the company's background and learn about the owners. This is when I found out that two moms were behind this amazing company. And, when I read their mission statement, I knew I had to reach out and see if they would share this story with you all. "Our lives are filled with an infinite array of possibilities. What we choose to see becomes our experience. Whatever we focus on will grow. Reflect Who I Am wants to remind girls everywhere that they are who they see in the mirror. They reflect the beauty, the courage and the brilliance that is within them. We do not only want to inspire girls, but awaken them to their true self. Reflect Who I Am was created by Tricia Price and Marci Hower, parents wanting to let girls everywhere know they are that amazing person in the mirror, regardless of what others may think or say about them. From the time our girls are born we tell them how smart they are, how beautiful they are, how brave they are, and how they can achieve anything they want. We protect them the best we can, but as they get older the world starts chipping away at their self esteem. A teacher tells her she isn’t smart enough, a boy tells her she isn’t pretty enough, a coach tells her she’s not good enough and she begins to doubt the girl she sees in the mirror every day. No child should feel there is no hope or be limited by the negative influences of others. The founders of Reflect Who I Am want to give girls everywhere a daily reminder of just how special they are. Reflect Who I Am t-shirts were created to cultivate and cherish, to express and expand, and to discover and design their true selves. They live in the world they create. We want girls to deliberately look for their inherent strengths, gifts, and positive possibilities in each of them." But, in the meantime, please enjoy my Spotlight on Mom interview with Tricia Price and Marci Hower, of Reflect Who I Am. Company Name/Product/Service: Reflect Who I Am creates and sells original mirror image shirts for girls. 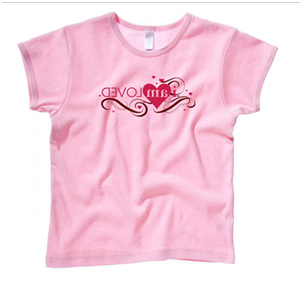 These shirts are designed to encourage girls to love who they are and help boost their self-esteem. In a nutshell, our mission is that every girl love who she sees in the mirror. If you looked on Marci’s kindle, it is loaded with favorites from her book club like First They Killed My Father and Rules of Civility. Tricia’s kindle is filled with lots of Young Adult books, including the Twilight series which is her absolute favorite. Tricia Price and Marci Hower are co-founders of Reflect Who I Am. Tricia is the mother of a son and two girls ages 13, 11 and 6. You can often find Tricia cheering in the bleachers at a youth sporting event, giving standing ovations at the local theatre or enjoying an evening at a school music recital. Marci does not have any daughters in her household, but as a mother of three fabulous sons ages 12, 11, 8 it is a safe bet that there will be some product lines for boys in the Reflect Who I Am future. Marci likes entertaining, she always seems ready to host a houseful of people. Reflect Who I Am creates and sells original mirror image shirts for girls. 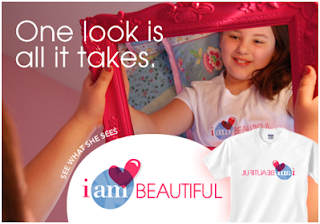 These shirts are designed to encourage girls to celebrate who they are and boost their self esteem. We want girls everywhere to love who she sees in mirror. The shirts are sold exclusively through www.reflectwhoiam.com. Tricia first thought of the reflective imagery when she wanted to help her daughter build up her self-esteem and confidence. Tricia wanted to remind her every time she looked in the mirror that she was beautiful -- both inside and out. This great idea was so strong, we wanted to share it with all girls struggling with their identities, and that is when Tricia partnered with Marci to help bring the business to reality. In a word… Interrupted. Working from our homes, we have a lot of interruptions. Luckily we are connected both online and with the same mission. We often work off hours or when the kids are at school. We are constantly writing, folding, packing, posting, tweeting, and mailing. It is the passion we have for our mission that drives us. Creating awareness that our company even exists. That is why we are so grateful to Robin for reaching out to us. It is people like her that care about our mission, and help us grow. Like us on Facebook, and help us extend our reach further. We have worked, played and collaborated together for over a decade. Marci has been in the marketing business for over 20 years. Her last position was as the VP of Interactive Marketing at a direct marketing firm before sprouting her own wings with start-up ventures. 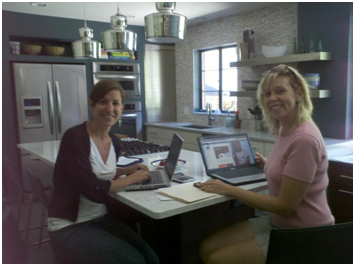 Tricia has worked as an online marketing specialist in the Cleveland area for nearly 15 years. She specialized mostly in Search Engine Marketing, but recently has added Social Media Marketing to the mix. Throughout the years she’s worn many hats in the workplace and is definitely a Jack-of-all-trades when it comes to marketing. Every success is a major success for us, especially because we are a start-up. Our web site launch, our first order, our first press release, our first Facebook like, our first re-tweet, our newest product launch, getting Robin’s email. It’s nice to take a moment and breath in all of the things to be thankful for when you are moving so fast. We believe strongly in our product and mission and we are excellent marketers. However, at the core of our business are t-shirts, and we knew very little about the apparel business. It has been a learning curve for us, but now we know all about sizing variations, thread counts and ink saturations. Our product line’s high quality is a testament to that knowledge. Having a business partner has been incredible. When one is having a brain freeze, the other seems to be on a roll. When one needs a break, the other has the extra time. When one sees the glass half empty, the other sees it half full. We have balanced each other well. And if we didn’t have a passion to inspire girls to see the beauty, the courage and the brilliance that is within them, we wouldn’t be inspired to spend so many hours working. It doesn’t feel like work, it feels like life. Our secret?... No matter what, family comes first. We also offer many activities on our site, that parents can do with their daughters to help boost self-esteem. We have gotten great feedback and encouragement to develop curriculum that will be available online for groups such as girl scouts, schools, and churches. Follow your passion. If you create from the heart, inspiration and money will follow. They have some great stuff and I love that their products are inspirational.